This is my DS Jonathon. He is 10 years old and growing so fast!!!! Knowing about my Scrap habits, at times he is very patient and enthusiastic about my photograpy, but other days not so! This photo was taken at the Conservation area that is just below our home. He and a friend spent a few hours toboggoning on a nice steep hill that leads down to the Sugar Shack. The gently falling snow made for some awesome pictures. So much for the Balmy Weather. After two days of warmth in the plus celcius range, we are back below zero again. Good thing for Norton (the cute little penguin)......at least he is comfortable. Punches are not just for creating the shapes that they were intended for. An imagination, a few snips and tucks and Voila!!! you can create all sorts of wonderful critters and images. 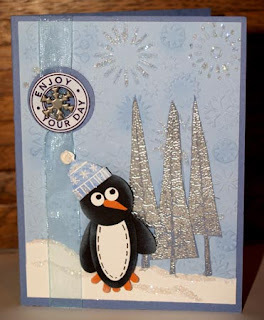 I am not sure exactly who originally designed the penguin, but you can see many wonderful examples of punch art on splitcoaststampers (can you tell SCS is my FAVOURITE website???). From sweet little frogs to very cool baskets and bugs, there are so many ways in which you can use your punches. 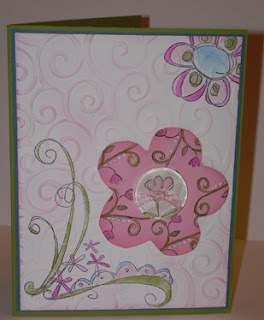 Check out my SCS gallery for a very cool tag punch flower and an additional card made with the large oval punch. Stamp sets used in the creation of Chilly Winter include the riveting hostess stampset, happy camper and the sweet toque is from the bundle up set. All images copyright SU! 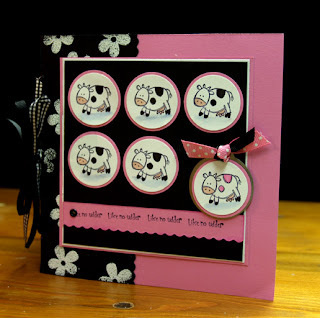 Another card I created using the Big Blossoms Stamp set! Boy oh Boy, it has been a hectic couple of weeks. There are definately not enough hours in the day and that is even for a nightowl like me, who only requires five or six hours per night!!! I have been doing a little stamping, but not too too much posting. 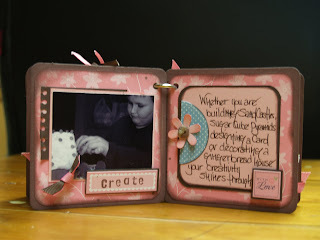 This is a wee tag card I created (oh my gosh, do I sound like Mrs Doubtfire!!!!) This is what happens when you drink too much Diet Pepsi at night!!!!! with the NEW Bunny Hugs set in the SU! Winter Mini. 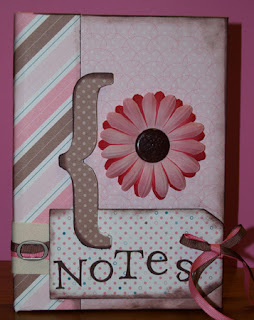 I also used the Petals and Paisley designer Paper (Isn't it just yummy!). The flower is from the Big Blossoms set. Easter will be soon approaching as February seemed to fly by!!!! Not just because of our record snowfall. It actually looks more like Christmas now than it has in the last few months. 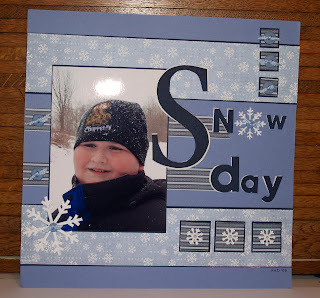 Jonathon was hoping for a snow day, but no such luck! I was so excited to receive my SU! Spring Catalogue preorder yesterday. I can't wait to create and share many new projects with you. 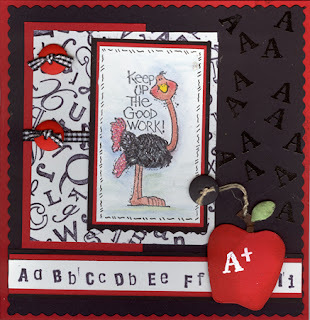 This card was created with the Doodle This and Doodle That Stamp sets. The images are SO sweet and will make lovely spring cards. I think that they will be ideal for scrapbooking as well. 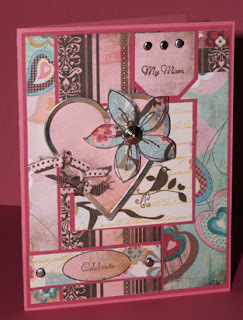 I also used The Big Blossom set to stamp the pink flower on the back of the cardstock and cut out the image. 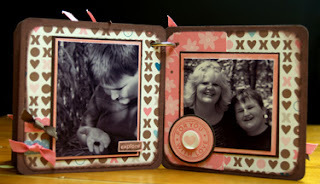 What do you think of using the embossing template over the watercoloured images? 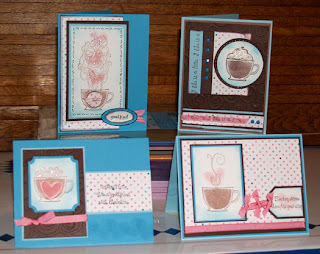 These Cuttlebug embossing templates are the best!!! I am waiting for several more that should arrive later this week. Yeah!!! Christmas twice this week! These cards were created for a Splitcoast Challenge, which was to make four cards out of the same stamp set with the same colour combination. It is neat too see how different your cards can look even when you use similar elements. There are endless possiblities for your creativity and even with some rules and limitations, one can still continue to acheive variances in look and style. My thought for today is to challenge yourself with your creativity; keep striving to expand your frame of reference with your artwork and play play play! We are celebrating my Mother's 67th Birthday today. She was born in Sudbury on this date in 1940. The temperature in Sudbury today is -31 degrees. Mom is sure that it must have been colder on the day that she was born!!!! I am very fortunate to share a home with my Mother. She is an invaluable help in many aspects of my life. She is youthful, fun and we are often mistaken for sisters, which inevitably THRILLS her!!!! 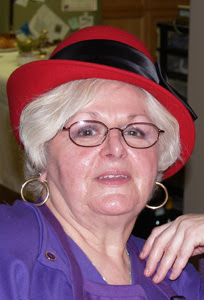 I hope that I look just as beautiful as her when I am sixty-seven. My Birthday wish is that she enjoys many many more happy and healthy years! Want to increase your Creativity??? 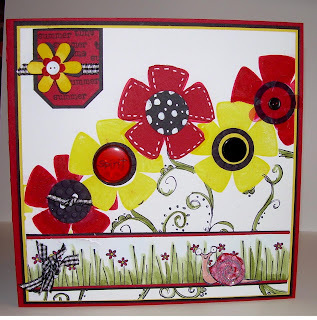 Try out the challenges on Splitcoast Stampers!!! There is a new challenge posted each day. Challenges include working with sketches, colours, Limited supplies. I have found that participating in these challenges has helped me improve my stamping immensely and also motivates to stamp several times per week. This card was created for Today's Limited Supply Challenge. The challenge was to make a "tag" using something that was not a traditional tag stamp. 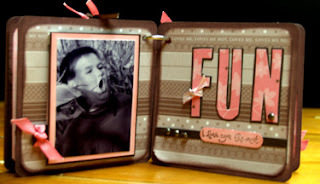 All stamps and papers are from Stampin' Up! 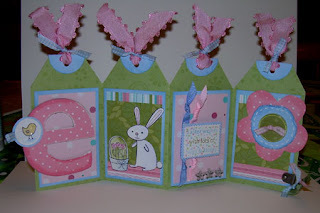 My tag was created by using a Sizzix die cut. I swear that this die has been hanging around for four years and this is the FIRST time I used it!!!!!! If you haven't tried the challenges, I encourage you to give it a try!!!! Caution: These challenges can be almost as addictive as Stamps and Paper!!!!! Here I go again!!!! I don't know what's happening to me!!!! I have never been a HUGE fan of Pink. Even as a little girl, pink was my least favourite colour. I guess I can rationalize the "pink" thing by pairing it with brown...........what the heck, I even made a pink album for my Son for goodness sake!!!! This is almost frightening!!!!! Anyway, I started this Composition Book for a Challenge a few weeks ago and thought I should get around to finishing it. Once I gave up Tole Painting for Stamping, I vowed that I would leave no project unfinished ( he he!!!! ). I must say that I am getting a little better with this, but far from perfect still. The composition book is made with SU patterned paper and chipboard, A biggie Bazzill Brad and Flowers and the Cuttlebug Olivia Alphabet. The pretty Grosgrain Ribbon and Wide twill is also from Stampin' Up! The weather is GREAT for stamping!!! Snowy and Cold.................Makes me want to stay in my jammies all day and Stamp. In keeping with the Valentine Theme, I designed a 6x6 mini book as a goodbye momento for a coworker. 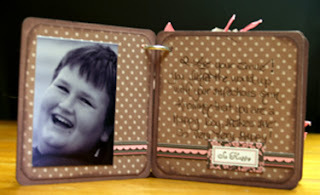 We had fun at work last week taking the photographs, which I mounted on a seperate page. Each person will then write their own farewell message. This was a fun project and worked up fairly quickly. I attached the pages with Ribbon. 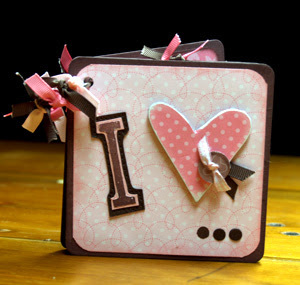 All stamps and supplies are from Stampin' Up! Images from SU, copyright 2005-2007. Love is Still in the Air!!!! More Pictures from the mini album. 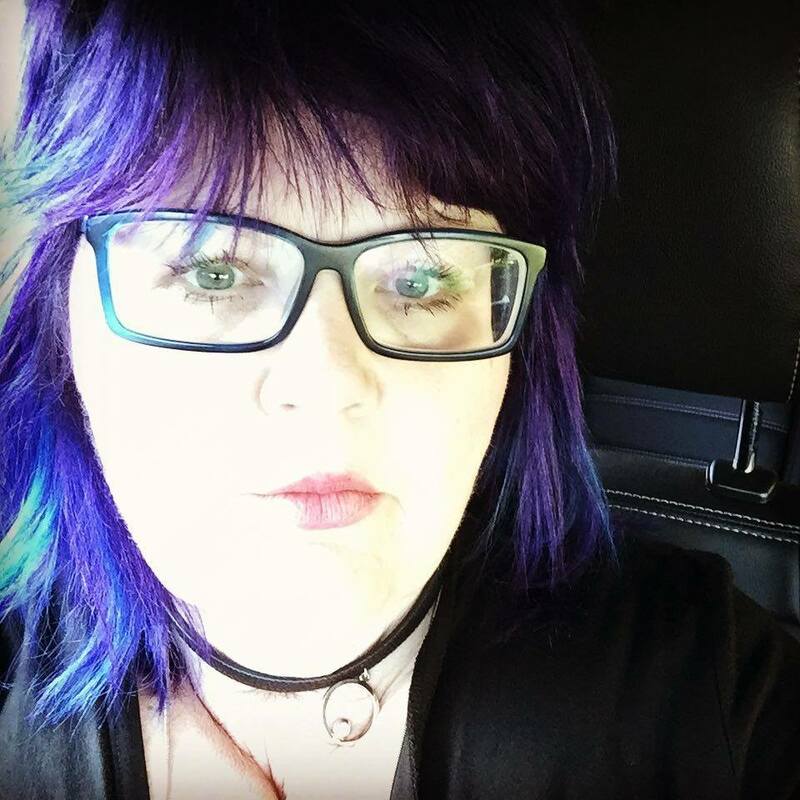 I am new to blogging, so it may take awhile to iron out the wrinkles! Valentines day is quickly approaching. I signed up to do a mini album challenge with a talented group of swappers and I decided to go with a Valentine Theme. I also received 600 coasters this week and thought I better start doing something with them, rather than having them collect dust along with the "gazzillions" of other Stampable items that are screaming for attention. Seeing that I was making one Album, I decided to make a second one for my son for Valentine's day. He hasn't seen it yet, but I thought i'd share with you all, seeing that my postings have been scarce!!!!! Hope that you enjoy the project. All stamps are copyright SU (1997-2007). 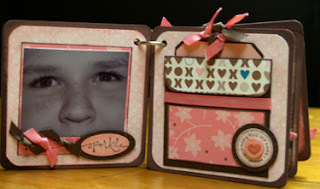 All Papers, Inks and accessories on this project are Stampin' Up! Products.